It’s hard to know how a workshop will be received. Some of the best ideas for workshops – the ones we’ve got really excited about for their novelty and cleverness – have gone down like sad lead balloons. So Lost Properties was an unknown for us, as well as everyone else. The method was slightly askew, as often with our art/poem forays. We had a market stall, a suitcase filled with random objects donated by Oxfam and a big pack of luggage labels. The idea was to ask people to discuss caring, that deep connector between us all. 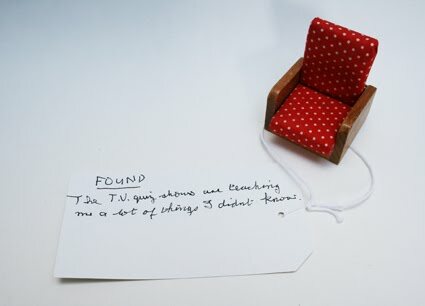 People would write their thoughts, then pick an appropriate object and attach the label, the final piece to be photographed and exhibited on the internet. At 9am we strung up our banner and began laying out the stall in the art market at St Ann’s Square in central Manchester. At just before 10am we had our first participant. He was a large distracted looking man with a big, open face. In his hand was a credit card, fanning at the hot summer air. You have to be deft if you’re working with the public in a busy space, so instead of my usual roundabout explanations, I simply said: “We’re asking people to write about someone you’ve lost or found. Number one participant wrote FOUND: my dad because he still gives me pocket money. He grinned slyly and fanned a little more. On the other side of the label he added LOST: my mum’s friend. I think I saw you in Tesco. Then with great decisiveness he picked up a little metal toy from the suitcase, Dr Who standing in the doorway of the Tardis. 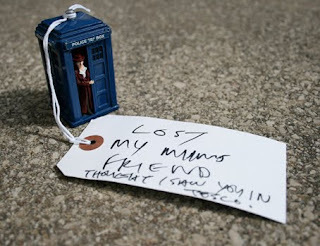 With the label attached, the Tardis transformed – just as it’s supposed to in the stories. In place of a battered secondhand toy, it became a symbol for a missing woman, melted into space – and also for the in-between state of this enigmatic man with his open face and air of puzzlement. Our second customer wrote on a pepper pot LOST: myself and I had a mental picture of him ground to powder and scattered by the forces of life. Just like a poem that doesn’t fully reveal itself at first, the day brought with it many people and their stories. They spoke of who they’d lost and who they’d found to bring comfort. The common thread between was the openness that people were willing to offer. It was as if by opening up they also could let go of something. Mid-afternoon, our market stall was filled with little icons of intimacy. Many people – hundreds – stopped by to look, to read, to comment. A lot of the pieces were funny, and the onlookers often went away from the stall chuckling. But as well as smiling at the jokey pieces, they also (perhaps? hopefully?) were smiling because they recognised something more deeply of themselves. Lost Properties was as per usual an experiment for us. We didn’t quite know how people would react. Some of the participants were intensely moved by what they found in themselves, the things unlocked. 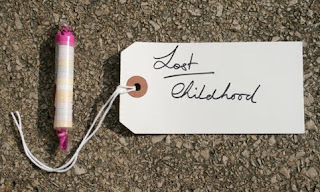 One lady wrote two words only – and then handed me the label. “My hands are shaking,” she said. For others, it communicated their state of mind outward to the world. One man knew all too well the things that troubled him, they came without a surprise packaging. Later in the day, I saw him look into the bin outside MacDonalds for food leftovers. Lost Properties is a project about caring. You maybe a carer, need care yourself, know someone else who does, or help pay for care through your taxes. Care and support affects everybody. We are looking for ways to describe the people you care for most and the people who care for you. Lost Properties is an experiment in making art without using drawing or pictures, only words and objects. There is no right or wrong, just self-expression. This event has been kindly sponsored by Oxfam and Manchester Markets.